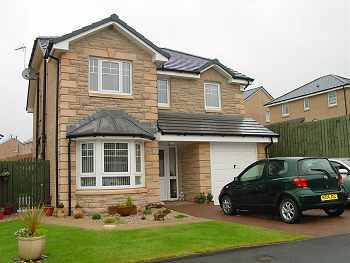 Exceptionally well appointed modern detached four bedroom house in prime residential location on the edge of town. The property, which benefits from double glazing and gas central heating, is in immaculate condition throughout and has recently been enhanced by the addition of large conservatory to the west side of the house. Bedroom two has been fitted with a bespoke made to measure office which can be included in the sale. Broadband available. All curtains, blinds and floor-coverings are included in the sale, and viewing is highly recommended. Accommodation comprises:- Ground Floor - Hall. Lounge. Sitting Room. Dining Kitchen. Utility Room. Conservatory. Toilet. 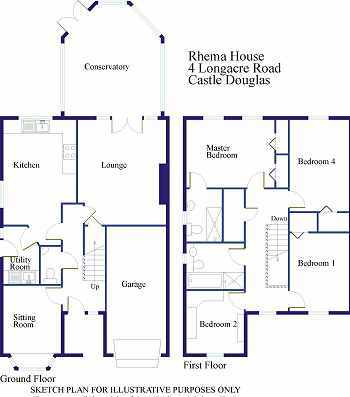 First Floor - 4 Bedrooms (1 En-suite). Bathroom. Ornate double glazed UPVC entrance door with side screen. Stairs to first floor. Smoke detector. Radiator. French doors leading to conservatory. Feature fireplace with inset electric fire. Door to understairs storage cupboard. Two telephone points, television and satellite point. The satellite dish will be included in the sale Two radiators. East facing bay window. Glazed door to hall. Radiator. Windows to west and south. Fitted with an extensive range of floor and wall units and ample worksurfaces with inset 1½ bowl stainless steel sink. Gas hob with chimney style stainless steel extractor hood and built-under electric oven. Space and plumbing for dishwasher. Door to utility room. Expelair. Radiator. Irregularly shaped room fitted with floor and wall units, and worktop with tiled splashback and inset stainless steel sink. Spacious conservatory added to west side of the house and with polycarbonate roof. Corner wash hand basin and WC. Heated ladder style towel rail. Expelair. Spacious landing with shelved storage cupboard and hatch to attic with attic light. Smoke detector. Radiator. Window to east. Built-in shelved and hanging wardrobe with space saving door. Radiator. Window to east. Currently fitted out as a bespoke made to measure office and all fittings can be included in the sale. Telephone point. Broadband available. Radiator. Window to west overlooking the garden. Fitted with shelved and hanging wardrobes with mirrored space-saving doors. Telephone and television points. Radiator. 1200mm fully tiled shower cabinet with electric shower. White wash hand basin and WC. Ladder style heated towel rail. Expelair. Window to west. Built-in shelved and hanging wardrobe with mirrored space saving doors. Radiator. Partially tiled and with white suite comprising bath, semi counter-top wash hand basin and back to wall toilet with concealed cistern. Fully tiled shower cabinet with electric shower. Ladder style heated towel rail. Expelair. Wall mounted gas combination boiler. Power and light laid on. A block paved driveway leads to the garage and provides off road parking to the front. There is gravelled and paved pedestrian access to the rear garden which is in lawn with a paved patio, flower borders and shrubs. The energy efficiency rating on the EPC is C.
Mains supplies of water, gas and electricity. The property is connected to the mains drainage system. Gas central heating. The property is currently in Band E but it is understood that this will be changed to Band F at time of sale. By arrangement with the Selling Agents or by contacting the sellers direct on 01556 505434. Offers in the region of £265,000 are invited.